CollegeNET, Inc., a leading provider of web-based on-demand technologies for higher education, today released the 2016 Social Mobility Index (SMI), a data-driven system that ranks 4-year US colleges and universities according to how effectively they enroll students from low-income backgrounds and graduate them into promising careers (http://socialmobilityindex.org). The goal of the SMI – now in its third year – is to help redirect the attribution of "prestige" in our higher education system towards colleges that are solving the major problems of our time. Today, no social, political, or economic problem is more pressing than advancing economic opportunity more broadly for our citizens. "Unlike other college rankings that are aimed primarily at helping students select a college," says Jim Wolfston, CEO of CollegeNET, "the SMI helps policymakers see which colleges are addressing the national problem of economic mobility. Administrators have a better chance to help strengthen US economic mobility and the promise of the American Dream if they can identify and learn from colleges that are already skilled at doing this." The 2016 SMI data analysis clearly shows that higher education’s key role in advancing economic mobility and the American Dream is rapidly deteriorating. Tuitions are increasing, economic inclusion is declining and Pell Grants – intended for disadvantaged students with financial need – are being awarded more generously to richer families. In fact, the 2016 SMI data reveal that at least 21.5 percent of the Pell Grants at 2,829 colleges or universities are going to students from the upper income half of our population. Wolfston explains: "Tuition is on track to double in approximately 27 years. The number of rich kids receiving Pell Grants will double in seven years if the current growth rate holds. Finally, if the share of economically disadvantaged students attending college continues its current pace of decline, in 50 years there will be no students from the lower US income half attending college." What everyone already knows is that skyrocketing tuition limits educational opportunity and grows massive student debt. What isn’t necessarily obvious is that higher sticker tuition correlates with a campus culture of non-inclusion. 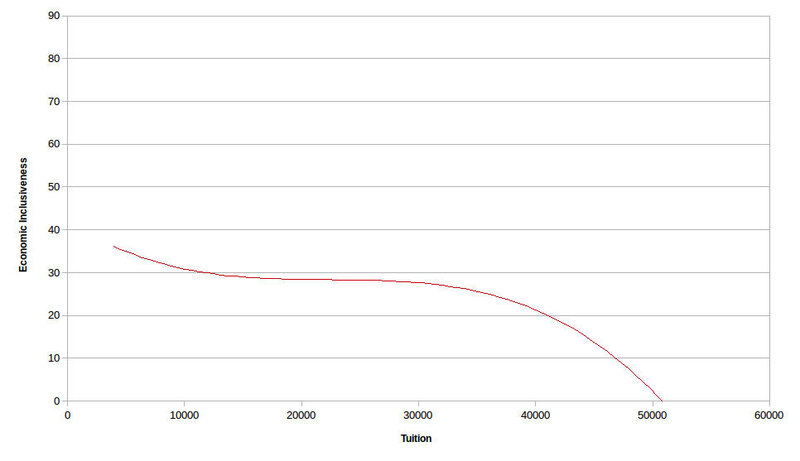 More specifically, as the chart below shows, when annual college tuitions increase – particularly beyond $30,000 – economic inclusion plummets. "Despite the special tuition breaks and various forms of financial aid offered by the most expensive colleges," says Wolfston, "these schools overwhelmingly enroll the rich. But this fact is routinely obfuscated by press releases proclaiming student body diversity and yearly percentage increases in Pell Grant distribution. However, a student body representing all 50 states and a variety of ethnic backgrounds does not constitute an engine and example for economic mobility when the enrolled students predominantly hail from richer families." Almost every one of the 60 slots is occupied by a public institution. The California state system represents nearly 50% of the top 20 rankings over the past three years; the New York state system holds about 20% of the slots. CUNY Bernard M. Baruch College occupied the #1 ranking in 2015 and 2016. Rowan University in New Jersey is the only institution to be ranked in one of the top three slots for all three years. Webster University in Missouri, North Carolina A&T State University and Granite State College in New Hampshire experienced significant gains in economic inclusion in 2016. One of the reasons these institutions have fared so well on the SMI is because they have developed innovative academic programs designed to support low-income students that help them realize the significant opportunity a college degree offers. "We have a campus-wide ethos related to quality, access, affordability and serving as a regional economic engine," says Dr. Rory McElwee, Associate Vice President for Student Retention at Rowan University. "These are our four strategic pillars, and they reinforce our student success mindset. We don’t have a sink-or-swim mentality. And we have many support structures in place so students can reach their full potential. We understand the impact that higher education can have when it comes to social mobility." Dr. James T. Strong, Provost at California State University, Stanislaus, adds: "The fact that Stan State continues to appear in these national rankings is no accident. Our mission as a University is to foster the future success of our students, most of whom will be first-generation college graduates. For instance, we’ve established an Advising Success Center that puts all our advising resources in one place to make staying on-course toward graduation an attainable goal for all students. In addition, being a smaller campus has some advantages, such as our 22:1 student-teacher ratio, which is the second-lowest in the CSU system." "The past three decades for US higher education will be remembered as a capitulation to the pressures of status, rank and marketing image," concludes Wolfston. "Along the way, the important national agenda of ensuring accessibility, broadly developing human capital and protecting our nation’s political position as a land of equal opportunity has been undermined. Fortunately, however, a few extraordinary colleges have remained focused on providing educational opportunity to promising students regardless of their economic background. We salute these institutions, and the SMI highlights their civic contribution." An in-depth web site devoted to the SMI rankings and methodology can be found at http://socialmobilityindex.org. CollegeNET, Inc. builds on-demand SaaS technologies that help institutions improve operational efficiency, enhance communication with constituents, and save money. The company’s systems are used by 1,300 institutions worldwide for event and academic scheduling, recruitment and admissions management, web-based tuition processing, instructor and course evaluation, and web-based career services for students. Additionally, the company operates CollegeNET.com, a social network through which students create topics, write about them, and vote to determine who will win scholarships. CollegeNET.com has awarded more than $2 million in scholarships to date. The company is headquartered in Portland, Oregon.